While I’m ranting, a post by Councilman Lombardi on Faceplace reminded me that I had a bunch of photos I took over the spring that I meant to post. I mean, this can’t be good can it? It looks like salt migrating out of the conctete when it’s wet. 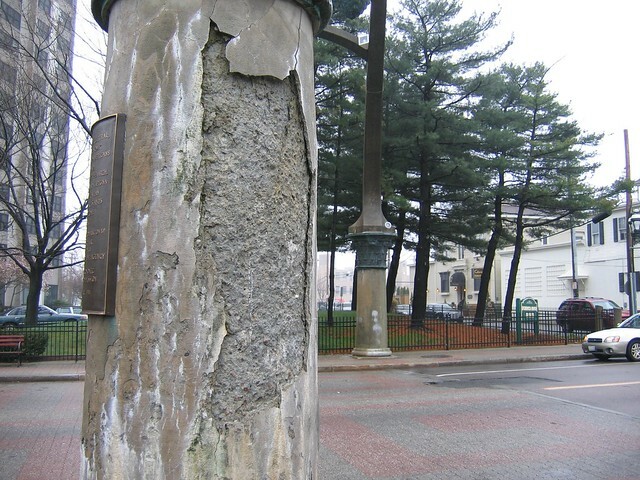 Maybe they could remove the damaged surface areas then parge the column as a temporary fix. It would be a dramatic failure when if or it goes. … when or if it goes. 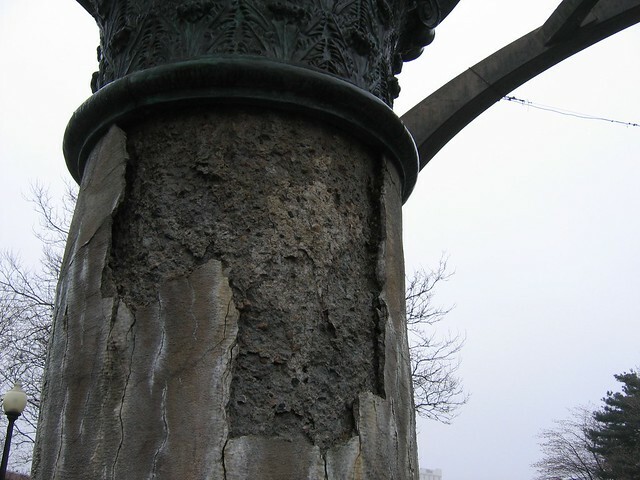 The columns need to be replaced. But I doubt the city has the money. Haven’t we, as a human civilization, been doing concrete for a while now? Why haven’t we gotten this down? Why is the train station crumbling for this reason too? I just had a guy come to look at some crumbling concrete in my driveway, and he said the person who did it for the previous owner “didn’t do this concrete right.” Huh? Can someone enlighten me as to the complexities of concrete? Don’t use aggregate in the concrete that contains salt. Concrete can last longer if it’s protected from wetness, especially from acid rain or chemicals used to keep streets clear of ice. This is a good article that talks about how to do concrete that avoids the corrosive nature of road and de-icing salts. Its also not just the salt. 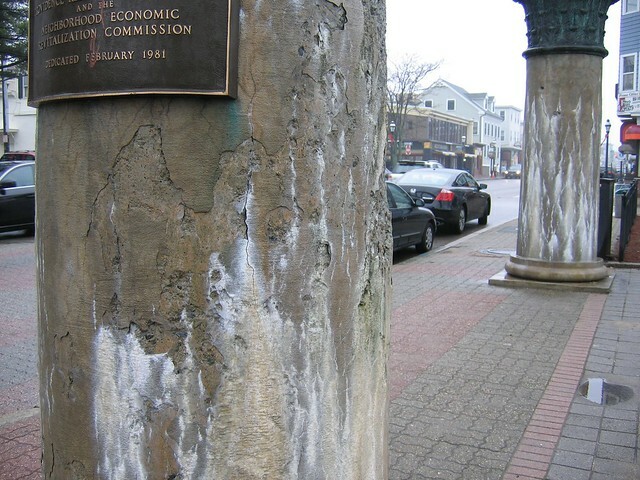 Its the freeze thaw cycles of typical NE winter that take its toll. I heard a totally unsubstantiated rumor that the RIRRC grinds up most of the plastic and ‘sells’ it to the landfill to use as a ‘cap’ for the daily waste. That way they can say that they ‘recycled’ and that they ‘sold the recyclables at a profit’. City-provided trash/compost/recyclable barrels are the -only- barrels that will be picked up. The twist would be that you would pay a lot more for a ‘full size’ trash barrel, the standard-issue would be quite small. Barrels would have to be issued with your address branded onto them to prevent theft. Whoops, that was meant for another thread, though that concrete could probably be used to cap off today’s take at the landfill, by the looks of it. 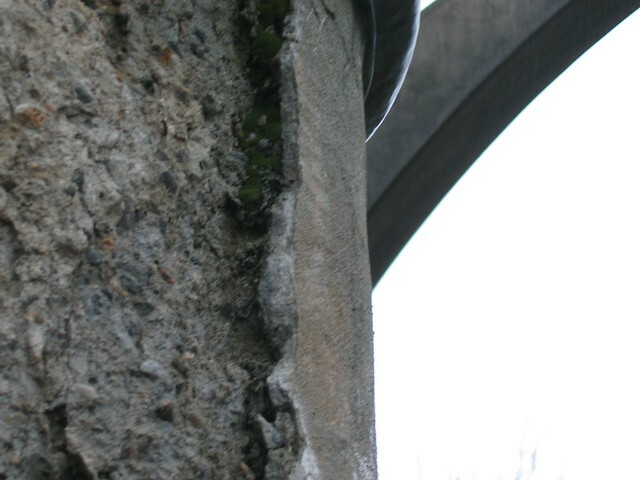 Chief engineer William Bombard said the arch’s four support columns are badly deteriorated, and the city will have to invest between $30,000 to $80,000 to have them wrapped in carbon fiber to prevent further erosion. Not sure what a carbon fiber wrap will look like, but I suppose it can’t be worse than crumbling concrete. 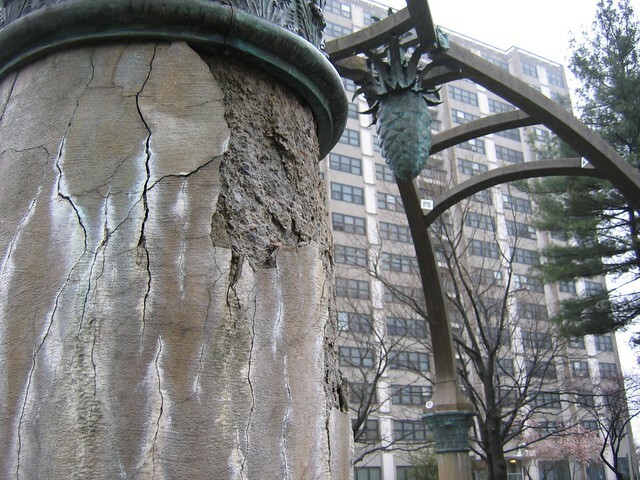 The city also considered taking down the arch and building new columns, but I imagine that would be a quite expensive course of action. 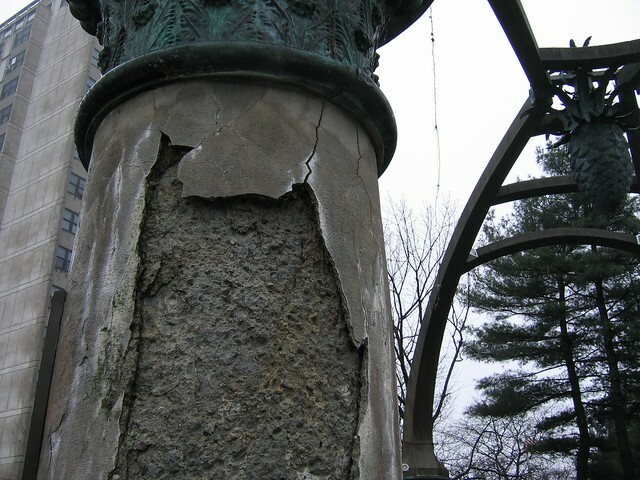 The engineer says the columns are sound and the arch is not in danger of falling. The arch was completed in 1980, making it just under 30 years old.